Hello. I have never liked the tone from the B and high E strings on my 1998 165 Herb Ellis. It's the older humbucker model. The unwound strings sound thin, brassy, and too bright. No body to the tone. I use Chromes 13's, although I doubt the string brand matters too much with the unwound strings. I can't dial it out much, and it is the same across multiple amps. I'm wondering if the TOM is responsible? I'd rather not move to a wood saddle, so I'm wondering if changing the individual saddles under the B and E to nylon would make a difference? Any info appreciated. This is how Herb adjusted his pickup poles. Don’t be afraid to be pretty aggressive with pole adjustment. Interesting. Thanks, I'll try it. Also experiment with pickup height. There are an almost infinite spectrum of adjustments you can make between polepieces and pickup height. There is a large difference to my ears between a pickup adjusted very low and adjusted very near the strings. I find that different guitars sound better with different pickup heights. I always experiment with pickup height and polepiece adjustment on a newly-acquired guitar, and it's not unusual for me to change again as I change strings, or as the mood strikes me. It's completely reversible, or at least nearly so. It may be difficult to get back to the exact same height, but you can get close enough very quickly. The guitar, new or used, arrives with the pickups at some random height, which may or may not be optimal, and almost certainly isn't. That’s an interesting method. In my experience though, following the radius for pole adjustment will not result anywhere remotely close to a desirable balance for the neck pickup if your goal is a good jazz tone. Different strings will require a different setting, but I’ve never played any that will work that way. YMMV. That method would probably work fine if every string were identical. But on a guitar, every string is different. Different sizes, wrapped or unwrapped, and possibly with different wrappings. I've tried setting them all to the same height, and that's probably the worst setting you can use. I adjust by ear, and I start with something close to what Herb Ellis used, although I tend to start with the pickup itself at a slant, with the treble end slightly closer to the strings. If the wound strings have a non-ferrous winding, like bronze, I start with the opposite, but it's not a big slant either way, at least for a starting point. But every guitar I own has a sllightly different setting, both for height and polepieces. None follow the contour of the fretboard. I didn’t say it in my post, but if you look at the pic of the Herb set up, you can see that the pickup is indeed slanted with the treble side closer to the strings. Yes, I see it now that I was looking for it. That slant is actually more than I tend to use, but not out of the realm of possibility. As i said, every guitar needs a slightly different setting, and that can change with different strings or even, for some people, different amps. It's just a matter of personal preference. I agree, which is why I merely use this as a rough guide, to get me in the ballpark, then I adjust by ear. The G and B strings I find to be problematic. With a wound G, it ends up being the tallest pole piece. With an unwound G, it's the opposite. The B ends up flush with the cover or even a bit below. I found his mention of “natural vibrato” interesting, as I've noticed that myself. I like the idea of raising the pole pieces and lowering the pickup slightly as, to my ears, it gives additional clarity and note separation. To me, it brings a humbucker a little closer to a P90 tone. With a wound G, the steel core is thinner than either the B or E plain strings, but with an unwound G it's larger than either, so it's not surprising that the polepiece has to be adjusted that way. For me, the B is always very low compared to either, because I use a wound G. Like you, the G polepiece is always the highest, and then the other wound strings are progressively lower, since their cores get larger. This is why just putting the polepieces at the fretboard radius won't work, either with electric or acoustic strings. Don't forget to experiment with overall pickup height at the treble side, then at the bass side. Also consider a .14 high E string. Perhaps a .18 B string too but IMO that is usually not necessary. The move from .13 to .14 can thicken up the tone considerably though. Hello. I have never liked the tone from the B and high E strings on my 1998 165 Herb Ellis . . . it is the same across multiple amps. It would help to know which amp & speaker configurations. It would also help to know whether you're talking about playing in a studio / home setting, a club or a hall. This is how Herb adjusted his pickup poles. It's amazingly cool to be have the current owner of Herb's guitar share that. "In a world" awash in conjecture, the facts are shown! OP, I find the same thing. I push the guages on high E and B up one or two marks. I discovered, maybe here, after I had started doing it that Peter B. strings his guitar 14,18, 24, 32, 42, 52 which says to me he's pushing the E and B up by 2 guages compared to a regular 12-52 set. This guitar is only used a moderate volume or less at home. Mostly with the 73 Super Reverb. It sounds best with the Super, or the Top Hat, but the Top Hat has no reverb, and I like reverb in this setting. Anyway, the lack of body with the treble strings exists with all these amps, to the extent that I am setting the controls in such a fashion that tames the treble somewhat, but also clouds the whole guitar tone. I'm sure it's the guitar and not the amp. I think I can hear it when played acoustically. Since overall tone is adjustable at the amp, and you want to bend, why not try going a tad lighter on the bottom strings and tweaking the tone settings on the amp? Just a thought. Good luck! As @citizenk74 said you might try a slightly lighter set. I find that the thinness in the upper 2 strings is relative to the overall distribution of string tension. You might find that using a 12-52 or 11-50 set and pushing the guages on the topmost strings works. It wouldn’t be inordinately expensive to see if a lighter set does the trick. Anyways, good luck. After alot of trial and error with various pickup and pole height adjustments, I can say that that is not the issue. I do however feel that the guitars sounds better now in general. I believe the pickup was too close to the strings. Lowering it gave the guitar a quieter but more realistic and woody tone. I like it and will leave it that way. Also, my string to string balance is now improved with a setting on the B and E much like that of Mr. Ellis. However, the issue with the tone remains. I have come to realize that it's actually the whole guitar with a brassy tone, just much more noticeable on the unwound strings. I would think it's got the be the bridge or the pickup. The pickup I think should be a 57 classic, unless a PO changed it out. I have always been satisfied with 57's in the past, so I'm back thinking about the bridge. Thanks for all the replies. I have had this problem on the high E string with many different guitars. No amount of PU height and polepiece adjustment ever eliminated the plink. A lighter touch did help a bit. I then bought a Korean D'Angelico EXDC that didn't have the problem at all. I played it for several years and then the problem seemed to emerge. I attributed it to subtleties of the fret finish. That is, worn frets were the problem. I had a couple of luthiers look at it, but they didn't solve the problem and I gave up on the guitar. I eventually went to my current guitar, a Yamaha Pacifica cheapie, which doesn't seem to have the problem as much as the other guitars. But, my solution was to use a pedal board and thicken the sound electronically. Well, more of a work around than a solution, but that's as far as I got. There are a few Guitarists who use string saver saddles on the high E and B strings for the same reason as you are thinking of. Seems like it might help IF they sound so different from the wound strings. But a little acoustic mellowing from the saddles sounds like a good idea. I then bought a Korean D'Angelico EXDC that didn't have the problem at all. I played it for several years and then the problem seemed to emerge. First, for testing and possibly for performance setting, check your amp's tone control positions. The Fender tone stack is the typical circuit for virtually all amps, but it does not work the way you would think based on how the knobs are labeled. The treble knob does not increase high frequencies; it only reduces bass frequencies. Likewise, he bass control only removes treble frequencies. The middle tone control does not add middle frequencies; it acts as an insertion loss recovery (it just raises the entire frequency curve caused by the treble and bass controls without changing its shape). The tone stack has an associated +20dB gain stage so that all the removal of treble and bass from normally turning up the bass and treble does not result in too much loss of level. When you set the amp this way it is closest to being a "flat response", and you will need to turn up the volume a bit because the 20+dB gain stage is being bled of to ground and not boosting the level... you will also notice that the amp is very quiet - much less residual noise, even more so if you use input #2 because it is -6dB. So this is the first thing to do before testing changes on the guitar. What you are doing is taking the amp out of the equation so you can hear and evaluate just the tone of the guitar, for testing purposes. Don't be freaked out; doing this to a Twin Reverb knocks it down to a very clean 85 lbs. Deluxe Reverb. 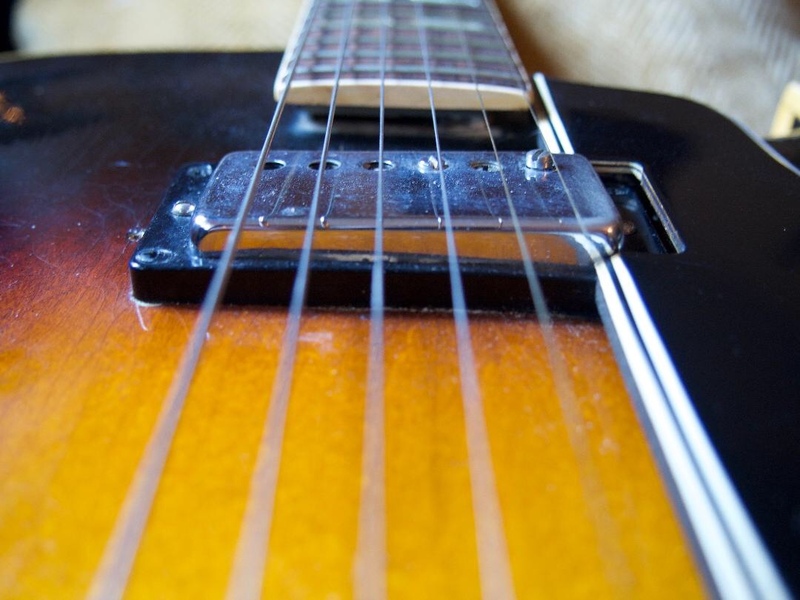 Lowering the pickup will typically get more "woody thump" across the board, partly because the increased distance from the string gives the pickup a wider "aperture" (it is responding to a longer length of the string) which results in a more complex tone. I replaced the bridge of metal individual adjustable saddles with a single piece wood bridge on my modest jazz box and noticed wonderful things right away - I recommend trying that. The plain violin strings often come with a little tiny tube of rubber which you can slide along the string, used two ways; one is to set the little tube over the slot in the bridge to slightly damp the string, the other is to slide it behind the bridge to prevent the string length between the bridge and tail piece from sounding. There is another version in the form of a tiny "o" (about the actual size of "o") - like a 3mm rubber band. These can be place encircling the slot so that the string on both sides of the bridge has a tiny rubber loop contact underneath it... so the string is in contact with the slot but has a damper in front and behind the slot touching the string, so both string taming and a little tail piece quieting are done. You can stop by any fiddle shop and get these little tubes or rings to see if they might help. For the little tube route, take a section of the strings you intend to tame in order to find the ones that fit tight. Hi persevere, as i dont believe its the actual guitar, I have 165 same pup, my previous 165 was also good. The bridge can make a definite difference in tone, and IME the base makes more difference than the saddle. On some guitars a perfectly fitted solid base sounds best, but on others a two-footed bridge sounds better. I've actually found some on which a poorly fitted base sounds better than a perfectly fitted one. It's pure trial and error, I never know until I try some different bridges. A TOM in general will sound brighter than a wooden saddle, so do experiment with those also. But the best combination just can't be determined in advance, because every guitar is different. The pickup I think should be a 57 classic, unless a PO changed it out. Based on an Alnico II magnet, the 490R & 490T models provide similar output levels to the Burstbucker models. Tonally, however, these pickups provide slightly more mid-range bite. also to my mind Herb also had a slighty twangy sound i love his playing. 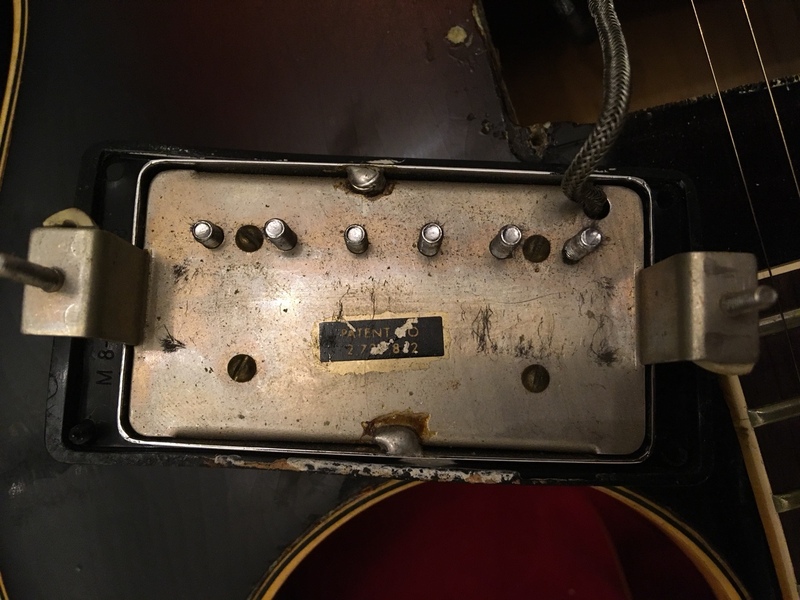 FWIW, here are pics of the humbucker that replaced the original P90 in Herb’s ‘53. I’ve never taken pics of the pots. I should do that sometime. Do you happen to know exactly what brand/gauge strings Herb played with this setting? I believe he was last playing Thomastik Swing JS112. I’m pretty sure Herb would tell you to adjust yours the way that works for your guitar/pickup. I’ve been thinking about making a video showing how he said to do it. Also you can try nylon or other alloy saddles just on the high strings. Nanoweb or Polyweb for the plain strings. There needs to be a saddle material that is tuned to mute highs a bit ( at the source -not the same as a Tone Control) . Nylon is one but there should be others .. I notice some Archtops come with both a tuneomatic bridge and a wooden( Ebony or Rosewood I assume )- BUT think of all the graphite / hybrid alloy saddles etc - they could develop different alloys . They do not sound muffled at all - but there is no twang at all acoustically and it is very loud and even and full unplugged for a solidbody .Wood vibrates all over during decay of chords etc. Louder and fuller than a 335 unplugged. So I am trying to figure out how to get this effect again - on a new Semi etc. And saddles can be important I think. But the Luthiery should help. One of the things I listen for in a new Electric unplugged is full tone and volume from the unwound strings . So they sing with a flute- like or Alto Sax like ring and sustain..
Last edited by Robertkoa; 01-22-2019 at 05:11 PM. I took 2 guitars with this problem to an experienced luthier. He thought that, in both cases, the issue was the bridge saddles vibrating. They're supposed to be solid. In one case I replaced the bridge. Better, not perfect. Still working on it. I have noticed that not all amps/settings reproduce the problem. You can hear it more with the treble up. In the other case, he made sure there was no freeplay by turning the screws. Then he put some dense foam in front of the saddles, with the goal of damping more vibration. Something worked, because the guitar was much better. you could try a coated B and E string.Or using diffrent Bridge materials you could try. Use a EQ might do it. I would first try the pickup adjustments if you have the type poles that screw in and out. As I understand it all B and E strings are steel. But not sure about the thin part. I just to day watched a lot of videos about pickup and types of magnets used what the careristics of different magnets produce A 2 to A8 and ceramic you should look in to that aspect of the pickup to adjusting a sound. also look at Gauss strength of each pole. This is an interesting post. I sure like just picking up the guitar and playing it without all of the anxiety about strings, pole pieces, what Herb did or didn't do, fender amp design, etc, because I spend most of my budgeted anxiety on cords, phrasing, new tunes, digging myself out of tired patterns. Good to hear about stuff that I don't worry much about to get a measure of my freedoms. Or problems to which I don't realize I'm having!